My friends from the Philippines and the US have been posting photos of their Korean fried chicken experiences and I’ve been so very jealous! The chicken looked so amazing that I was feeling very left out. 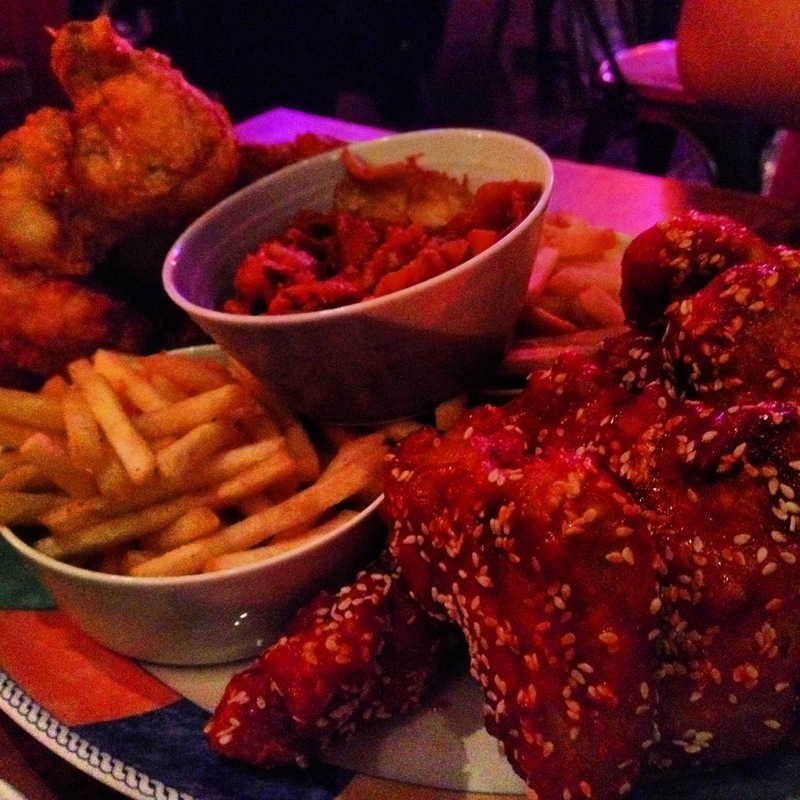 Unfortunately, the Bonchon Chicken chain hasn’t made it over the pond and until very recently, the UK was completely unaware of how good Yangnyeom Tongdak was! 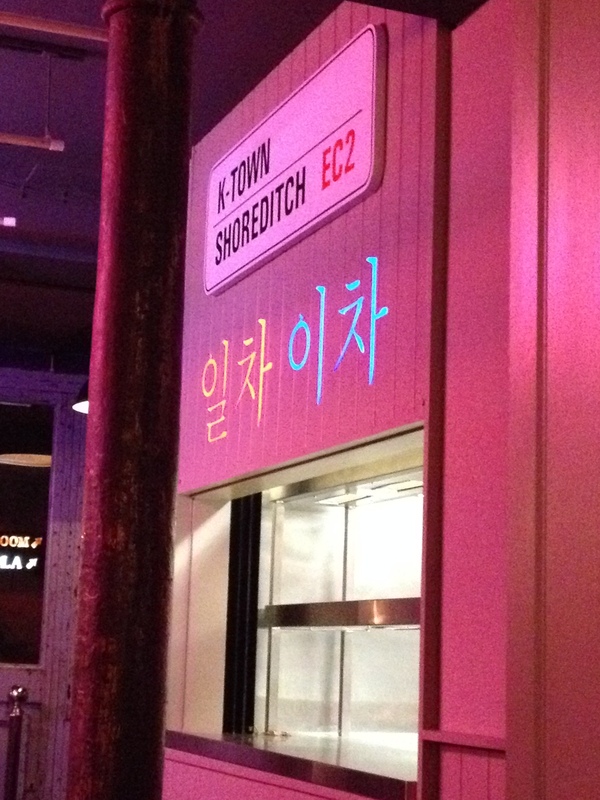 It’s a little Korean canteen that’s installed in the Bedroom Bar in Shoreditch. It was a little bit of a trek to find the Bedroom Bar but let me tell you, if you love chicken, this is definitely worth the trip! The chicken is fried twice with a choice of 2 lovely syrupy glazes: soy garlic and hot and sweet. You can choose between getting wings or getting strips. There are also other things on the menu, bulgogi subs and steam buns filled with slow cooked belly pork. But we didn’t try those on our visit. We came for one thing alone: the chicken. I apologise for the grainy photos but the lighting in Jubo wasn’t conducive to food photography. It is, after all, in a bar! The photo of the chicken dinner platter (8 wings, 8 strips and 3 sides – if you get this ask for half-and-half so that you get both the soy garlic and the hot and sweet!) doesn’t do the chicken justice. I’m not a chilli junky but I love the hot and spicy best because there is a perfect balance of heat and sweetness and, pardon me for using someone else’s chicken reference, but the chicken, in my opinion, is meant to be eaten by hand and is, very definitely, finger-lickin good! Mind you, the soy garlic does give the hot and spicy a run for its money because it’s equally tasty. There are no words to describe how lovely the chicken is. Despite the fact that the chicken is twice-fried, it was so moist and succulent! The staff are friendly and love their product so they’ll help you with the menu. Mind you, there’s not a lot but what they do have on the menu is the best of Korean “pub” fare. Make sure you have the kimchi (I love kimchi!). I’m of the persuasion that it’s homemade! Eat your heart out Bonchon! You missed a trick. Jubo London has claimed London!